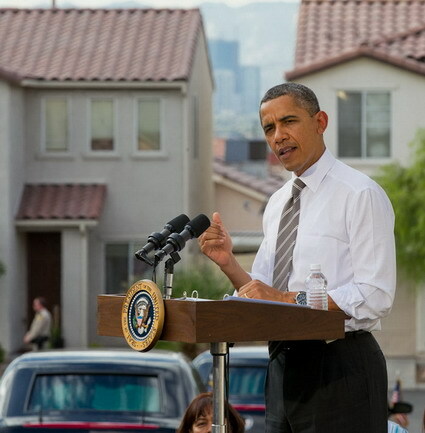 President Barack Obama visited with and spoke outside of the Bonilla Family home in Las Vegas, NV today. he spoke about the American Jobs Act. Below are full notes from the White House. THE PRESIDENT: Well, it is wonderful to be with all of you. And I want to thank Jose and Lissette and their wonderful children for letting us set up right in front of their house, and we just had a wonderful visit. Without a doubt, the most urgent challenge that we face right now is getting our economy to grow faster and to create more jobs. I know it; the people of Nevada know it; and I think most Americans also understand that the problems we face didn’t happen overnight and so we’re not going to solve them all overnight either. What people don’t understand, though, is why some elected officials in Washington don’t seem to share the same sense of urgency that people all around the country are. Last week, for the second time this month, Republicans in the Senate blocked a jobs bill from moving forward — a bill that would have meant nearly 400,000 teachers, firefighters, and first responders being back on the job. It was the kind of proposal that in the past, at least, Republicans and Democrats have supported. It was paid for, and it was supported by an overwhelming majority of the American people. But they still said no. Your senator, Majority Leader Harry Reid, he’s been fighting nonstop to help get the economy going. But he’s not getting some help from some of the members of the Nevada delegation. So we need them to get their act together. Because the truth is, the only way that we can truly attack our economic challenges, the only way we can put hundreds of thousands of people back to work right now is with bold action from Congress. That’s why I’m going to keep forcing these senators to vote on common-sense, paid-for jobs proposals. But last month, when I addressed a joint session of Congress about our jobs crisis, I also said that I intend to do everything in my power to act on behalf of the American people — with or without Congress. So I’m here to say to all of you — and to say to the people of Nevada and the people of Las Vegas — we can’t wait for an increasingly dysfunctional Congress to do its job. Where they won’t act, I will. In recent weeks, we decided to stop waiting for Congress to fix No Child Left Behind, and decided to give states the flexibility they need to help our children meet higher standards. We took steps on our own to reduce the time it takes for small businesses to get paid when they have a contract with the federal government. And without any help from Congress, we eliminated outdated regulations that will save hospitals and patients billions of dollars. Now, these steps aren’t substitutes for the bold action that we need to create jobs and grow the economy, but they will make a difference. So we’re not going to wait for Congress. I’ve told my administration to keep looking every single day for actions we can take without Congress — steps that can save consumers money, make government more efficient and responsive, and help heal the economy. And we’re going to be announcing these executive actions on a regular basis. Now, today what I want to focus on is housing, which is something obviously on the minds of a lot of folks here in Nevada. Probably the single greatest cause of the financial crisis and this brutal recession has been the housing bubble that burst four years ago. Since then, average home prices have fallen by nearly 17 percent. Nationwide, more than 10 million homeowners are underwater. That means that they owe more on their homes than those houses are worth. And here in Las Vegas, the city that’s been hit hardest of all, almost the entire housing market is under severe stress. Now, this is a painful burden for middle-class families. And it’s also a drag on our economy. When a home loses its value, a family loses a big chunk of their wealth. Paying off mortgage debt means that consumers are spending less and businesses are making less and jobs are harder to come by. And as long as this goes on, our recovery can’t take off as quickly as it would after a normal recession. So the question is not whether or not we do something about it — we have to do something about it. The question is, what do we do and how fast do we move? One idea that I’ve proposed is contained in the jobs act that is before Congress right now, and it’s called Project Rebuild. A lot of homeowners in neighborhoods like this one have watched the values of their home decline not just because the housing bubble burst, but also because of the foreclosure sign next door, or the vacant home across the street. Right now, there are hundreds of thousands of vacant homes like these and more than a million unemployed construction workers. That doesn’t make any sense when there’s work to be done and there are workers ready to do it. So Project Rebuild connects the two by helping the private sector put construction workers to work rehabilitating vacant or abandoned homes and businesses all across the country. That will help stabilize home prices in communities like this one. And it will help families like the Bonillas to buy a new home and build a nest egg. This is something that Congress can pass right now, because it’s in the jobs bill. We will put construction workers back to work and we will rebuild homes all across Nevada and all across the country. If Congress passes this jobs bill, we can get Project Rebuild moving right away. If Congress acts, then people in Nevada and all across the country can get significant relief. But remember what I said. We can’t just wait for Congress. Until they act, until they do what they need to do, we’re going to act on our own, because we can’t wait for Congress to help our families and our economy. Over the past two years, we’ve already taken some steps to help families refinance their mortgages. 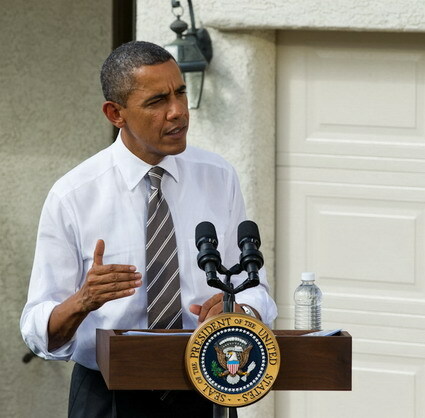 Nearly one million Americans with little equity in their homes have gotten assistance so far. And we’ve also made it easier for unemployed homeowners to keep their homes while they’re looking for a job. And we’re working to turn vacant properties into rental housing, which will help reduce the supply of unsold homes and stabilize housing prices here in Las Vegas and all across the country. But we can do more. There are still millions of Americans who have worked hard and acted responsibly, paying their mortgage payments on time. But now that their homes are worth less than they owe on their mortgage, they’re having trouble getting refinancing even though mortgage rates are at record lows. So that’s going to soon change. Last month, I directed my economic team to work with the Federal Housing Finance Agency — or FHFA — and their partners in the housing industry to identify barriers to refinancing, knock those barriers down, and explore every option available to help many American homeowners to refinance. And today, I am pleased to announce that the agency that is in charge is going to be taking a series of steps to help responsible homeowners refinance and take advantage of low mortgage rates. So let me just name those steps. Number one, the barrier will be lifted that prohibits responsible homeowners from refinancing if their home values have fallen so low that what they owe on their mortgage is 25 percent higher than the current value of their home. And this is critically important for a place like Las Vegas, where home values have fallen by more than 50 percent over the past five years. So let me just give you an example. If you’ve got a $250,000 mortgage at 6 percent interest rates, but the value of your home has fallen below $200,000, right now you can’t refinance. You’re ineligible. But that’s going to change. If you meet certain requirements, you will have the chance to refinance at lower rates, which could save you hundreds of dollars a month, and thousands of dollars a year on mortgage payments. Second, there are going to be lower closing costs, and certain refinancing fees will be eliminated — fees that can sometimes cancel out the benefits of refinancing altogether, so people don’t bother to refinance because they’ve got all these fees that they have to pay. Well, we’re going to try to knock away some of those fees. Third, there’s going to be more competition so that consumers can shop around for the best rates. Right now, some underwater homeowners have no choice but to refinance with their original lender — and some lenders, frankly, just refuse to refinance. So these changes are going to encourage other lenders to compete for that business by offering better terms and rates, and eligible homeowners are going to be able to shop around for the best rates and the best terms. So you take these things together, this is going to help a lot more homeowners refinance at lower rates, which means consumers save money, those families save money, it gets those families spending again. And it also makes it easier for them to make their mortgage payments, so that they don’t lose their home and bring down home values in the neighborhood. And I’m going to keep on doing everything in my power to help to stabilize the housing market, grow the economy, accelerate job growth, and restore some of the security that middle-class families have felt slipping away for more than a decade. Now, let me just say this in closing. These steps that I’ve highlighted today, they’re not going to solve all the problems in the housing market here in Nevada or across the country. Given the magnitude of the housing bubble and the huge inventory of unsold homes in places like Nevada, it’s going to take time to solve these challenges. We still need Congress to pass the jobs bill. We still need them to move forward on Project Rebuild so we can have more homes like this, and wonderful families having an opportunity to live out the American Dream. But even if we do all those things, the housing market is not going to be fully healed until the unemployment rate comes down and the inventory of homes on the market also comes down. But that’s no excuse for inaction. That’s no excuse for just saying “no” to Americans who need help right now. It’s no excuse for all the games and the gridlock that we’ve been seeing in Washington. People out here don’t have a lot of time or a lot of patience for some of that nonsense that’s been going on in Washington. If any member of Congress thinks there are no unemployed workers or no down-on-their-luck neighborhoods in their district that would benefit from the proposals in the jobs bill, then they better think again. They should come and talk to the families out here in Nevada. These members of Congress who aren’t doing the right thing right now, they still have a chance to take meaningful action to put people back to work, and to help middle-class families and homeowners like the Bonillas. But we can’t wait for that action. I’m not going to wait for it. So I’m going to keep on taking this message across the country. Where we don’t have to wait for Congress, we’re just going to go ahead and act on our own. And we’re going to keep on putting pressure on Congress to do the right thing for families all across the country. 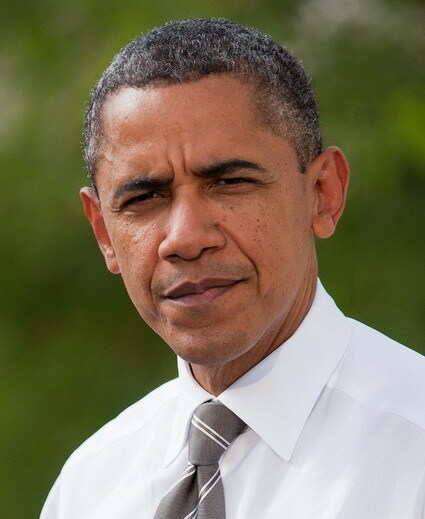 And I am confident that the American people want to see action. We know what to do. The question is whether we’re going to have the political will to do it.